Happy New Year my friends! 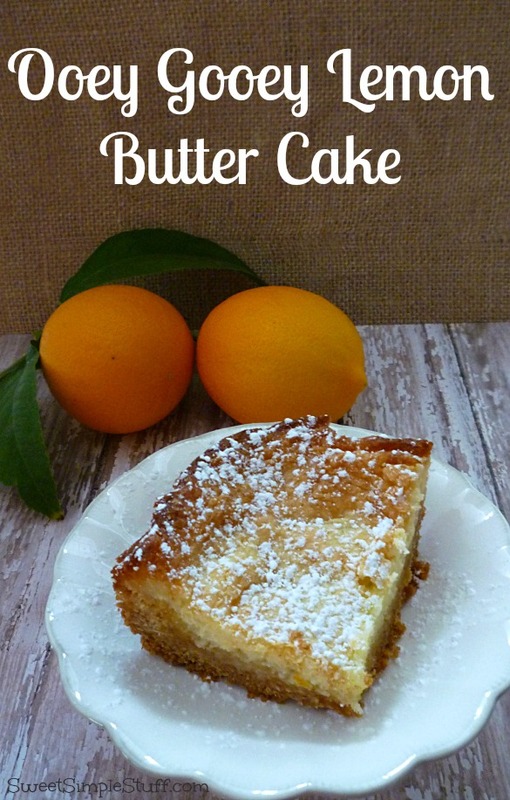 Let’s get the new year off to a sweet start … with a lemon dessert … a Ooey Gooey Lemon Butter Cake or as my sister-in-law calls it … Lemon Chess Cake. I recently discovered that the same cake goes by different names … doesn’t matter which name you call it … the cake is yummy! One of the benefits of winter is that my Meyer Lemon tree is filled with fruit! A few days ago, I asked my hubby what he wanted for dessert … he actually suggested lemon cake. That was a shocking answer coming from the mouth of The Peanut Butter Man! I had never made a Ooey Gooey Lemon Cake … this was the perfect time to give it a try and I’m so happy that I did! Meyer lemons tend to be on the sweet side, which gives this cake a nice lemon flavor … not tart or overpowering. 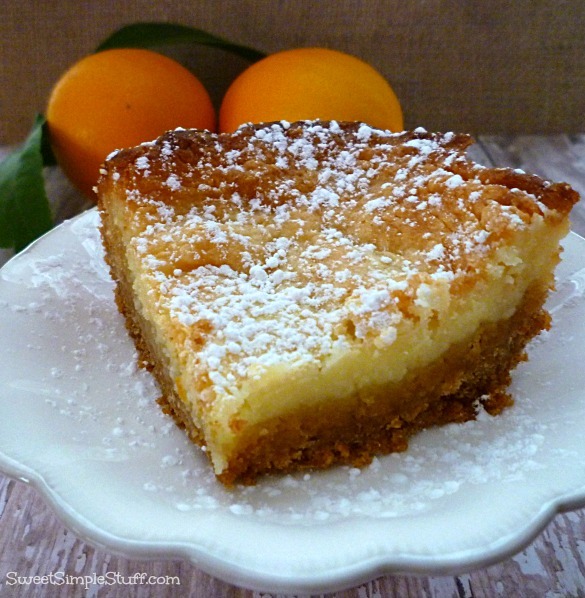 The crust is a little different from the traditional ooey gooey or chess cake. I added a package of pudding, which made the crust extra sticky and chewy … we liked it … bet you do too! I used one Meyer lemon for this recipe … they’re very juicy. If you use a different type of lemon, you may need two lemons to get enough juice. Prepare crust – In a large mixing bowl, use a wooden spoon or electric mixer to combine all crust ingredients. Pat the mixture into a 13″ x 9″ baking pan. Prepare filling – In a large mixing bowl, use an electric mixer to beat cream cheese until fluffy. Add the eggs, butter, juice, zest and beat well. Add the sugar, one cup at a time until all sugar is mixed in. Spread filling evenly over the crust. Bake for 40-45 minutes or until lightly browned. The center of the filling should jiggle when the pan is moved. Cool completely and sprinkle with powdered sugar. Cut into squares and serve. Hint – After I mixed the crust and put it in the pan, I used the same mixing bowl for the filling … why dirty another bowl? I can’t wait to try this. I love lemon stuff. Made lemon cookies for my Christmas cookies and used boxed lemon cake mix! They were a hit!! Thanks for sharing. Thank you so much Kim 😉 Lemon is one of my favorites too! It looks & sounds really awesome. I need to have my daughter make it for us.And I have to share this with every one I know. Thank you Anna 🙂 You won’t be disappointed! Brenda thanks for sharing this desert with us on New Years Eve., I loved it. Your hint: I thought I was the only one who does that. :} I try not to dirty any more bowls then need be even tho I do have a dishwasher; I Never use it. I want to take it out and but in a cabinet in ti’s place; something that will be more useful for me; a 12 year old dishwasher that was used twice. Hubby loves anything lemon. Will be making this for him for sure. Now, talking about lemon trees, I had bought a plant with a tag that said Meyer lemon; planted it and grew nicely and then fruit started to show up and thought cool, I will have some nice fresh lemons but as it turned out, it was a lime plant so needless to say; I now have what I call a limon of which it very well could be if it was crossed between a lemon and a lime. The fruit showed up green but the longer it was on the branch it turned yellow. By all means go buy another Meyer lemon … mine produces so much fruit, we give lemons to neighbors, friends and freeze juice too! We planted my tree next to the garage … hubby wants to put a side door in the garage … the tree will have to go, but I’m planting a new one before that happens! right now my dishwasher is being used to store my cooling racks, muffin pans, tart pans, brownie pans as well as my smaller cake pans, spring foam pans and anything else that I can squeeze in. :} Dishwasher makes for a good storage unit for all my extra pans and I do have lots of pans. 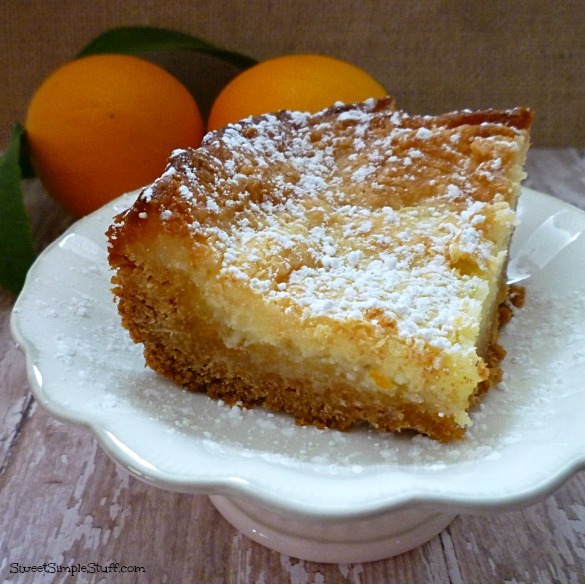 This sounds and looks delicious – I love lemon and I would want to eat the entire cake myself! I’m intrigued by all the comments about the lemon tree, Brenda. How about showing us a picture of it before it goes. I love anything lemon! Ohhh I think I need to try this. My inlaws have a lemon tree and we are about to get an influx of them! Thank you Katie 😉 Never can have too many lemons … we share ours too!